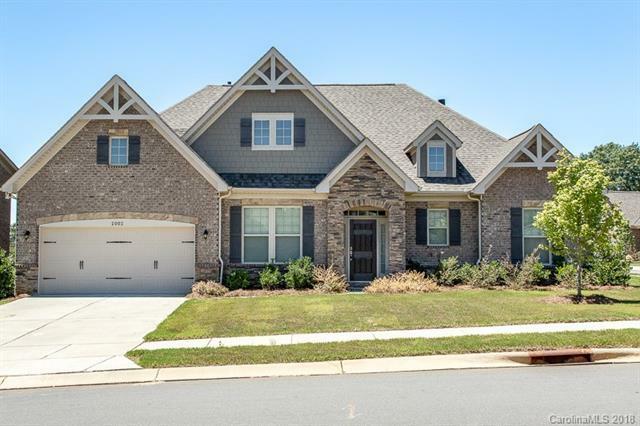 2002 Arbor Hills Drive, Indian Trail, NC 28079 (#3408222) :: Robert Greene Real Estate, Inc.
Don't wait to build. This totally upgraded FULL BRICK home built in 2016 is in immaculate model condition. Open floor plan with beautiful foyer entrance. Gleaming wood floors throughout. Dining Room with crown molding, tray ceilings, and butlers pantry. Family Room peering with natural sunlight and gas fireplace overlooks private yard. Master Suite has tray ceilings, lots of windows for natural sunlight and a huge walk-in closet. Master Bath with tile shower and beautiful glass doors, garden tub, and spacious vanity. Split bedroom plan with two spacious secondary bedrooms with walk-in closets. Gourmet kitchen with upgraded white cabinetry, stainless steel appliances, granite counters, tile backsplash, gas cooktop and huge island. Enjoy your nights under the beautiful private covered patio. Great Location !! Home won't last !! Sold by Cornerstone Realty Of The Carolinas.